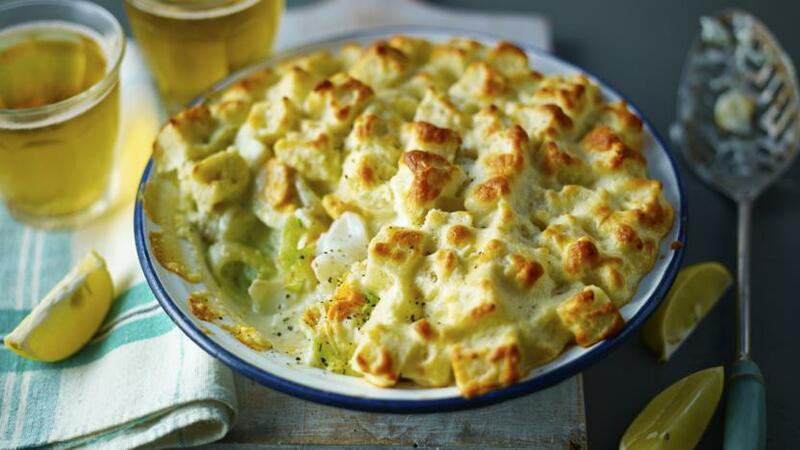 This is Mary Berry's fish pie with a twist, topped with a fancy soufflé style topping. Equipment: You will need a 1.5 litre/2½ pint shallow, wide-based, ovenproof dish. Grease a 1.5 litre/2½ pint shallow wide-based ovenproof dish with butter. To make the fish pie, melt the butter in a saucepan, add the leeks and gently soften over a low heat until completely tender but not coloured. Sprinkle in the flour and stir over a high heat for a minute. Gradually pour in the hot milk, stirring all the time until the sauce is smooth, thick and has come to the boil. Remove from the heat and add the chopped dill, lemon juice, fish and season with salt and pepper. Cook for two minutes, stirring. Remove from the heat. Spoon into a 1.5 litre/2½ pint shallow wide-based ovenproof dish. Arrange the eggs on top of the sauce and press in gently. Level the top and set aside until cold. Cover with cling film and chill in the fridge for about an hour or until firm. To make the soufflé topping, remove the crusts from the loaf and discard. Cut into five slices then cut each slice into small cubes (about 1.5cm/¾in across). You will need 150g/5½oz of bread cubes. Add the cream cheese, butter and cheddar to a saucepan, melt over a low heat until runny (the mixture may look curdled but do not worry). Set aside for a moment. In a spotlessly clean bowl, whisk the egg white until stiff peaks form when the whisk is removed. Fold the eggs whites into the cheese mixture. Season with salt and pepper and carefully stir. Stir in the bread cubes so they are all coated in the mixture. Spoon onto the top of the chilled fish mixture so the cubes are in a single layer. 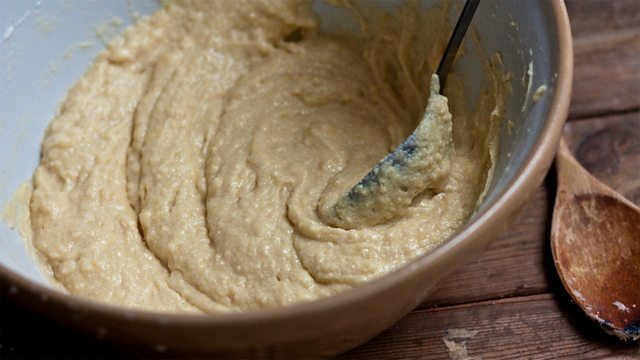 Bake in the oven for 25-30 minutes until golden-brown and bubbling. If it is getting too brown cover it with foil and continue to bake. Leave to stand for five minutes then serve with salad or green vegetables. To skin the fish, place each one, skin-side down, on a chopping board. Using a large, sharp knife, make a small cut about 1cm/½in from the tail (or narrowest) end of the fillet. Cut through the flesh, but not through the tough skin. Now take the flap of skin firmly in one hand (a sprinkling of salt can help you grip the slippery fish). Angling the knife blade away at from you at 45 degrees, insert it into the small cut and work it gently from side to side, cutting the flesh away from the skin in one piece. Discard the skin. If the sauce is a little thick due to over-boiling, add a touch more milk to thin it down.